Have you ever heard of Paula’s Choice Skin Care? I had been hearing about it from my aunt for years until I finally tried it a couple of years ago. I had a lot going on in my personal life and my skin was not happy about it! My skin looked tired, dull, and suddenly I was dealing with some adult acne – something I was really unhappy about. I was telling my aunt about all of this and she told me it was time to try Paula’s Choice. I was a little skeptical because I didn’t know anyone else who used these products. but when she told me about their amazing return policy I figured that I had nothing to lose. Honestly, I wish I had trusted her a long time on this. She’s been using Paula’s Choice for at least 20 years and I only hope my skin looks as good as her’s when I am her age. People have thought we are sisters, not aunt and niece, when we are together! I spent a couple of months trying a lot of different things to figure out what I liked and what my skin needed. I returned and was refunded, without any difficulty, anything that didn’t work for me. My skin looks and feels so much better now. And I don’t mind going in public without makeup on. There are tons of products that I love so I thought it would be easiest to share my Paula’s Choice morning and night routine with you. In the past using sunscreen on my face daily would clog my pores and cause breakouts, so it was great to find a daily SPF that is formulated for face and doesn’t cause acne. I get those little bumps, which I learned is keratosis pilaris – the buildup of keratin, a hard protein that protects skin from infection and harmful external substances. The keratina plug that blocks the opening of the hair follicle, resulting in patches of bumpy skin. This body treatment gets rid of that and makes my legs soft and smooth. *Once a week at night I use one of two different weekly treatments (such as one on Monday and another on Thursday): Resist Weekly Retexturizing Foam 4% BHA or Resist Weekly Resurfacing Treatment 10% AHA. The 4% BHA really unclogs my pores and the 10% AHA makes my skin bright and even. That might sound like a lot but it only takes a couple of minutes and I’ve been really pleased with the results. I honestly cannot tell you how great these products are. Naturally, I wanted to share my favorite products with my readers and offer you a $200 gift card giveaway AND a great discount! If you have any questions about specific products or what I like, please leave that in the comments section and I’ll respond. 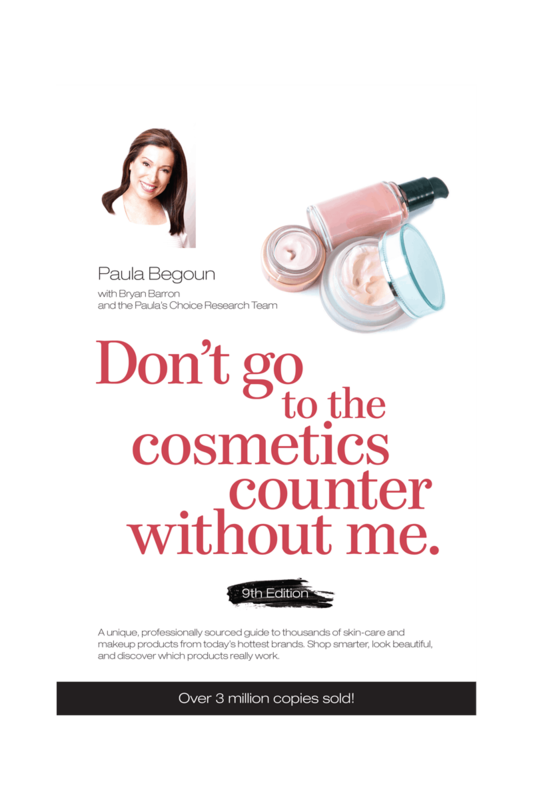 Giveaway also includes a copy of Paula’s best selling book, Don’t Go to the Cosmetics Counter Without Me. This book helps women find products that make them look great without spending a fortune. From drugstores and home shopping to department stores and catalogs, Paula Begoun and her team review the hottest skin-care and makeup products major cosmetic and skin-care lines. Regardless of the price tags, there are good and bad products in almost every line and with the turn of a page, readers can get concise reviews and fast answers in this completely revised edition. A user-friendly rating system makes it easy to find items worth trying. Paula also includes skin care basics and tips on which ingredients to look for so you get the results you want. Be sure to follow Paula’s Choice on Pinterest. They have lots of great pins about skin care, makeup tips and tutorials. You can also find them on Facebook, Twitter, and Youtube. Disclosure: I personally love and use Paula’s Choice products so I asked them if I could offer my readers a giveaway. They provided me with a selection of products. All opinions are my own. I have tried Paula’s Choice products, & my favorite product is the Earth Sourced Natural Cleansing Gel as I have sensitive skin. These products sound wonderful. I think I’ll try the bodyscrub first. I have the same small bps as you and they frustrate me! I have not tried Paula’s Choice. I’ve actually never heard of it before. I’d love to try the Resist Cellular Defense Daily Moisturizer SPF 25. I haven’t used Paula’s Choice products before, but I read one of her books years ago and it had lots of great tips in it. I’d like to read this new book, too. I used Paula’s Choice for awhile, tried to find some cheaper products, and went back to Paula’s Choice after those other products wrecked my skin! My favorite products are the rosacea kits – skin recovery for winter, and hydralight for summer. I’d like to try some products from the Resist line next. the 2% BHA lotion is great , I also like the clay mask!! I have not heard of this brand but would love to try it. The products sound amazing sign me up for the giveaway. My favorite is Resist Ultra Light Super Antioxidant Concentrate Serum. I love Paula’s Choice. Every product I’ve tried has been great! PC’s BHA Resist 9 is the only product that got rid of the millia on my cheek, it took several weeks but now my face is clear! I’ve been using Paula’s choice for at least 10 years and I absolutely love their products! 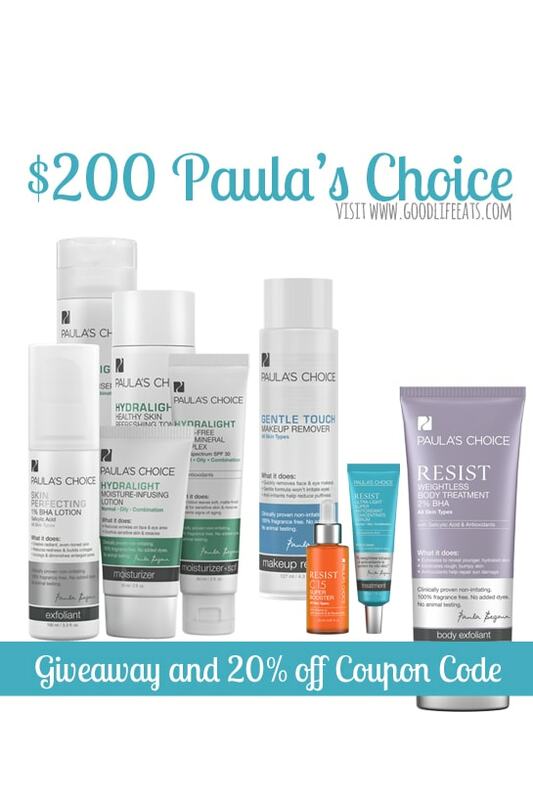 I haven’t used Paula’s Choice but would love to try their acne product line. I have used Paula’s Choice for at least 10yrs, my favorite product is HYDRALIGHT SHINE-FREE MINERAL COMPLEX spf 30. I’ve not tried Paula’s Choice but would love to, especially the Clinical Ultra-Rich Moisturizer for my dry winter skin. I love the aha products and the antioxidant serum. I have been using her products for over 15 years. Hi, my name is Judy and I am Katie’s aunt that she referred to in her comment. She is right I have been using Paulas Choice Products for almost 20 years, 18 plus a few months to be exact because I started to using her products when I was pregnant with my son who is almost 18 years old this April! I had just moved from Tokyo to Seattle and somehow I heard about Paulas Choice which was head quartered in Seattle. My skin then was thirty something oily with large pores and Paulas Choice had great products for calming down the oil but not over drying it. Now I have fifty something dryer skin with smaller pores thanks to Paula’s Resist line products! I have been able to count on her amazing products for years and best of all as I got older Paulas Choice came up with products addressing the aging but oily large pores skin.type. I have Introduced Paulas Choice to 7 woman and all of them have loved the results of Paulas Choice products! I love the Skin Recovery Cleanser! I haven’t tried Paula’s Choice yet. I want to try one of their cleansers for oily, combination, or acne prone skin (not sure which), RESIST Advanced Replenishing Toner; RESIST C15 Super Booster; RESIST Daily Smoothing Treatment with 5% Alpha Hydroxy Acid; Resist Weightless Body Treatment With 2% Beta Hydroxy Acid; Skin Recovery Lotion SPF 30; RESIST Weekly Resurfacing Treatment 10% AHA; RESIST Weekly Retexturizing Foaming Treatment 4% BHA; pretty much anything actually! have never heard of but would love to try any of these products!